Rowing in the single, and this being the first interval workout on the water of this season, I decided to reduce the prescribed stroke rates by two. I did a 3.5km warming up with a few 10 stroke segments at higher stroke rate. Between 3km and 3.5km, I rowed a circle, to create some more distance between a group of single scullers with a coach in a launch and myself. 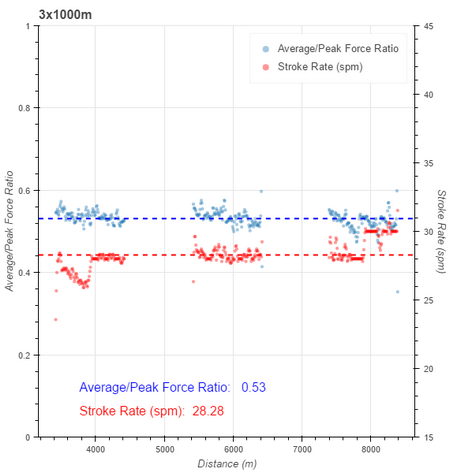 I had set up the SpeedCoach display to show stroke rate, power, ‘Wash’ (my technique attention point) and effective stroke length. At the same time I was gathering enough data to spend a nice 30 minutes after the row and look at them on rowsandall.com. Here is the overview graph. So already now I have a lot more information than if I would just row without any electronics, or if I would row with just pace. Even though I rated up to 30spm in the third interval, the average power was virtually the same (even 5W lower) than in the first interval. The pace was very similar, but without power numbers, we would have to estimate that the wind speed didn’t increase or decrease. I also know what caused the lower power because I was very conscious of it. During the third interval, around the middle of it, I rowed through an area with wake from a launch. There was wake coming both from the left and the right. It wasn’t the direct wake from a launch, but the waves that had reflected off the bank and were now traveling back to cross the lake a second time. The result is a weird effect where the single goes through some “S” alignment and balance is slightly off. Even though I was trying to work as hard (and it definitely felt hard), the power numbers dropped. Below, I will check some other metrics to see if the wave effect is visible there as well. Being slightly off balance and putting the blades into wavy water apparently causes the power to be lower. It also had an definite effect on my pace. The other thing that I have to watch out for is to not use overly powerful strokes in the first interval. On fresh legs, I seem to push a bit harder than I should. This is hard to control, because it just doesn’t feel so hard on those fresh legs, and also because the power values jump around a bit more than on the erg, so it is hard to regulate. 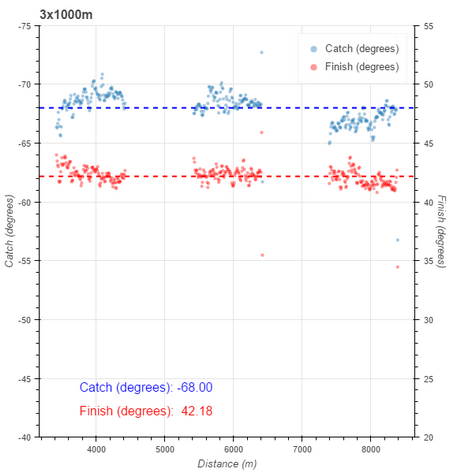 Now looking at catch and finish angle (picture above). Ah, I was cheating a bit in the third interval! Rating up to 30, but doing that on a shorter stroke. 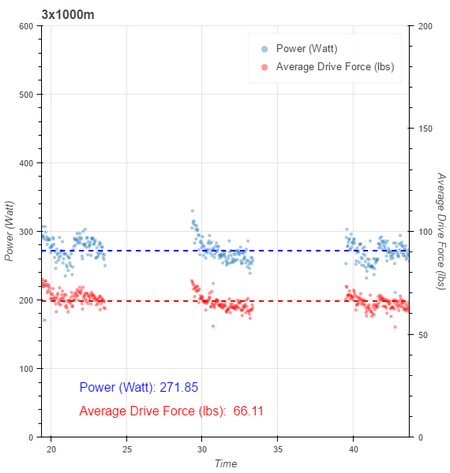 This scatter graph (above) is again power and average drive force. You can see the dip in the third interval, where I was rowing through the wake. I was fairly good in holding the prescribed stroke rates. Except in the first interval, which I started off with an enthusiastic 28spm and had difficulty to bring down to 26spm. We have also seen above that the 30spm in the final interval was achieved by shortening up on the stroke length. 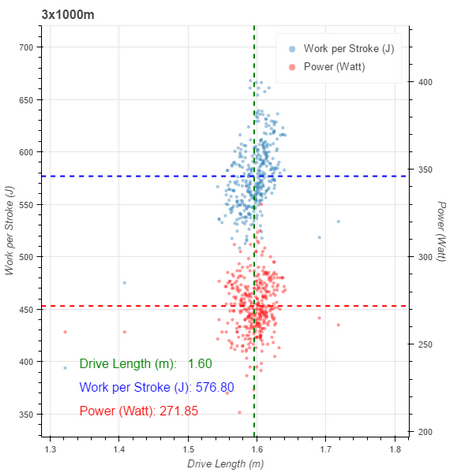 This next picture is just a distribution of work per stroke, power and stroke length. With the “flex plot” on rowsandall.com, you can plot any metric against any other metric. 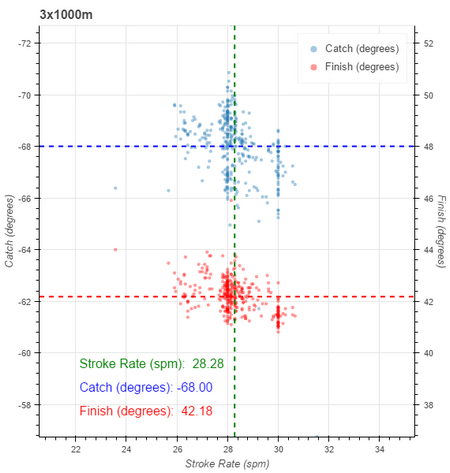 Here you can see that the catch and finish angles seem to get smaller (shorter) at the higher stroke rates. 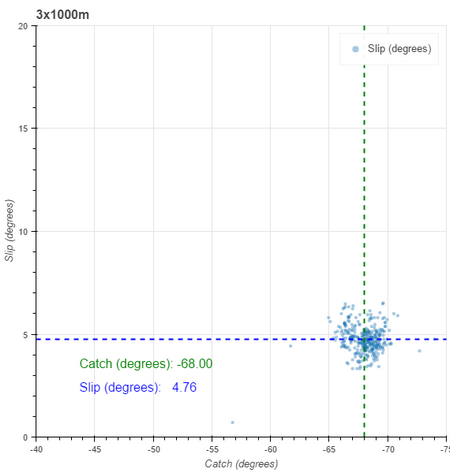 Slip seems to be under control, and also the distribution of catch angles is pretty consistent. 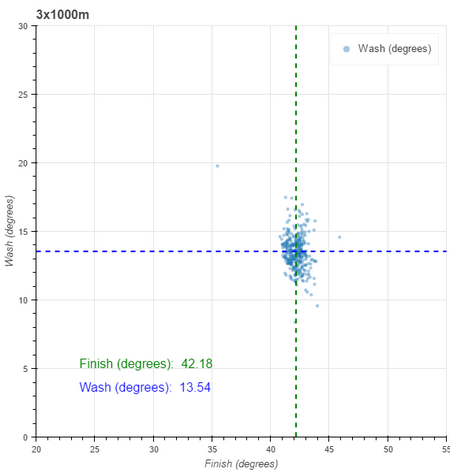 The distribution of “wash” angles is a bit larger, indicating a less consistent finish. 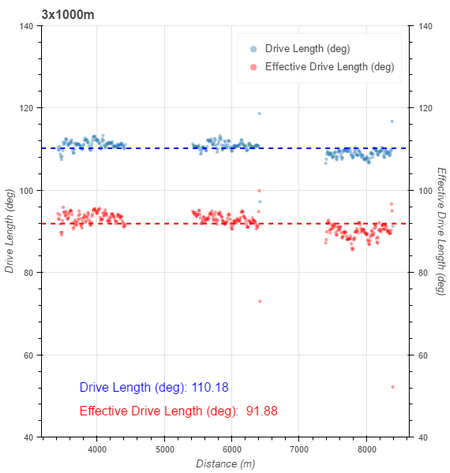 Effective drive length is the length of the drive minus slip and wash. YOu can see that this is fairly consistent for the first two intervals, and worse for the second. It also shows that during the rowing in the wake, in the middle of the third interval, when I was having balance issues, it was the “effective drive length” that suffered most. I am really excited about looking at my data like this. I guess if I were my coach, I would have a conversation with myself about that last interval. Well, I guess I am my coach!